Left thumb and right index finger not working!! To put in short (ish) - my thumb and finger are not working as they should. I have two sensors (360 setup) and ordered another sensor to see if that will fix it. If I play Dead & Buried, everything works just fine. If I do the touch tutorial, I can see if picks up my left thumb when I hover over other buttons, but unable to complete the tutorial as it wont lift the thumb. So why would it work on a game but not work on anything else? Is this then a software issue with Oculus Home? Hardware issue would mean it wouldn't work on anything, which I'd prefer to be the case as I can easily set up a RMA. I have tried all fixes that people have listed on here/reddit (thanks guys), the only thing I haven't tried is a full reinstall of Windows. This is indeed an ongoing issue that is not being recognized or acknowledged by Oculus. My nephew just had the same problem and was able to resolve it (temporarily, as it turned out) but uninstalling Sonic Suite. Then after a few days, the left thumb locked up mid game and he could not let go of objects. Then yesterday he got (finally) got his free games (Robo Recall, ect) and the thumb suddenly started working again! Once in game though, he got terrible screen stutter. More research found that AI Suite can cause that! And I actually had a "left thumb lock" panic moment myself just last night! Now, I have never encounter and issues with my controllers up to this point, but I had a few minutes after finishing Lone Echo and decided to mess around with my avatar. Upon entering the editing screen, my hands weren't even there. Then after messing around for a bit and changing the colors, my hands appeared with the left thumb stuck and only working is certain positions. I did a reboot of my computer and when I opened Home, everything was back to normal fortunately. These software conflicts and bugs need to be seriously catalogued and looked into by Oculus. At least to let us know they exist! Customer support seems to be clueless as they made no suggestions of possible software issues just "rerun the set up" and "send us a log". Thanks for the reply, I don't have Sonic Suite but do have Realtek or whatever Gigabyte supply - so will give try messing with that software for a fix. So thanks for the tip! We really need everyone that is having issues like this to bombard Oculus and their support team. Sending a link about rerunning setup is not going to cut it, that's clearly the first thing we are going to do. I feel that support would sort out an immediate RMA if they weren't struggling with running out of stock. Although many people are getting new ones and issues coming back - so not a hardware issue then?? A new update might fix things? I believe 1.17 is just around the corner. Having the same issue. Restarting the oculus app or rerunning sensor and touch setup seems to help at times but not consistently enough, and even then the right thumb sensor is still super 'sticky' (I have to almost life my entire hand off the controller to get it to sense the 'thumb up' position. Not cool Oculus. i have confirmed the problem with my right thumb sensor issue, it is the connection between the sensor pad and the spring contact. what i did was solder a piece of wire from the spring contact to the sensor pad, and it works flawlessly. 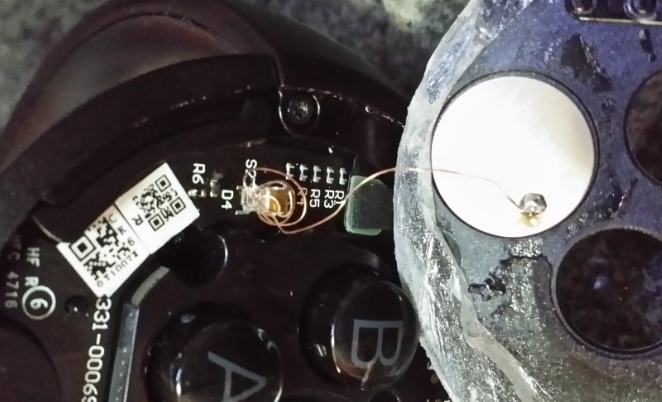 this is because oculus opted to use glue instead of screws or a jumper wire to secure this connection. before i did the jumper wire thing, my thumb was always 'sensed' and always down. Good find e_dilbert! Would you be able to provide a quick tutorial on how to fix this? Oculus would not do replacement for me as I'm on out the country warranty coverage so the only solution I have is to get it fixed on my own. it's not yet finalized,just a test. i suggest you use a very thin insulated wire half an inch i think will do, just enough to be able to open and solder them together. i got mine from overseas and it will be a lot of trouble sending it back. the right thumb was stuck down and sometimes intermittent on the 2nd day i received and used it. but you don't have to disassemble the thing, it is just a guide to show how it is built. 1. remove the battery and battery cover so you can access the round top cover and pry it open from battery side. 2. before prying it open, you must apply heat to the round top cover to soften the glue. a hair dryer will do. keep applying heat and pry it open at the same time (or use the method from the link). 3. then solder the thin wire (about half an inch long) as in the picture above (between the sensor and the spring connector) then put back the round cover and you're good to go. Thank you so much e_dilbert! That definitely helps! I'll give that a try! To be honest, it might be the first time I'm doing soldering. Do you have plans to fix the other controller as well just in case? Just curious, so it's because the sensor pad wasn't contacting well with the spring contact? Sorry. I'm not exactly sure how it works by soldering the wire between the sensor pad to the spring contact . I'm having issue with my left thumb being stuck as well. i suggest that you practice soldering first and use a sharp-tipped soldering iron. yes, the spring contact is not connecting well even though it is gold plated. i only have problem with my right touch controller, but i know what to do if the left one starts to fail. see the picture i uploaded for reference. if you are really unsure, try to get help from a friend who dabbles in electronics and show him/her the picture. Got it! It's pretty hard to find people doing soldering here. Worst case scenario, maybe I'll take a more newbie approach by using copper tapes and copper wire. That would maybe work too right? e_dilbert, many thanks for the possible fix. I'm getting mine returned (finally!) but if they break again I'll be grabbing the ol' tools from the shed. since it's a capacitive sensor, the connection must be very good. you can always try but avoid undoable modification. Please don't attempt to repair the device yourself, as that will void the warranty. If you are having an issue, please contact us first. We may be able to help or offer replacement. Thanks. i agree, this is only a fix for those who have no other option considered. Is that an acknowledgement that support will actually *do* something about this issue now that it's been investigated *by a customer* (at the expense of their warranty), and demonstrated to be a hardware fault / design flaw? My report of this issue was delayed and fobbed off multiple times with pointless requests and inane suggestions. I'm with Jawa, support was poor and I really don't want to go through another month of emails before things can be sent off to replace. I'm sending them off now but if these go bad again (which I've seen others have had happen) I might have to sort out things myself. I'd rather fix it myself and have a working controller for a good while than have to return touch controllers every second month. Hopefully none of this will happen when I get the new ones in. I did a quick test with linking a copper wire from the sensor pad to the contact switch but somehow it still didn't work for me. To be honest, I've been seeing multiple cases of people getting replacements but still having the same issues. My right controller works perfectly most of the time but sometimes it would still not allow me to do gestures upon booting up my PC and Oculus Rift. So I had to somehow re-setup everything to get it to work after some time.The left controller is the one that rarely allows me to do thumbs up. I did a test on Robo Recall by the way. You can only teleport after lifting your thumb off the stick. My left touch controller has the thumb animation stuck on it but it would still allow me to teleport after I lift up my thumb IRL. Tried it on my right controller (Which has no issue) and not lifting my thumb up would not allow me to teleport. So the left capacitor seems to work but it's just not animating correctly! I'm truly hoping it is some software issues or conlicts. Are there any specific drivers for the Oculus Touch installed on the PC which allows us to reinstall or something? Open Windows file explorer and select the option "Show hidden files"
Just wanted to share it here.